This is my home, a 1986 International school bus conversion I call the Yetibus. I live in it year round and travel in it for work and pleasure. The Yetibus is powered by straight vegetable oil, reducing my greenhouse gas emissions and subsequent contribution to climate change. 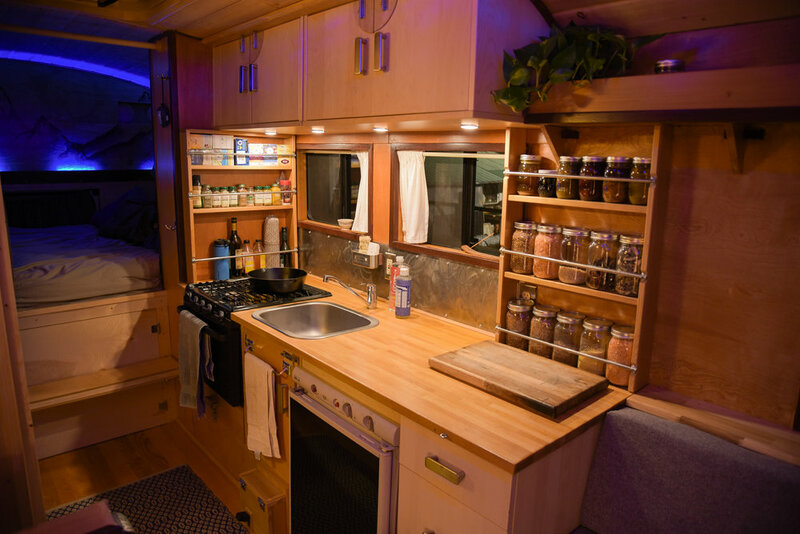 With an interior floor space of approximately 200 square feet, it's been an empowering adventure in small space and off grid living. Living life outside the lines of society's box has it's challenges but it's worth it to me. Small space living requires minimalism as a lifestyle. I own nothing I don't need and everything I do own has it's place in my bus. Practicing minimalism means removing the excess, physically and emotionally, to have clarity in your space and your mind. It helps me reduce life down to the things that matter. It's also more environmentally friendly. Less space = more efficiency and less consumption which creates a smaller ecological footprint. This philosophy of awareness and responsibility, although nothing new, has become more mainstream in the recently popularized tiny house movement. In light of earth's man made climate crisis, which is at it's base a cultural crisis, people are seeing the value in living small. What lies at the foundation of my freedom is my mobility. At any time I can pull up stakes and leave to go anywhere for any reason. Making a living on a project-to-project basis allows me to structure a life that inspires me. This bus is my adventure vehicle. This life is free of constraints, and like the beauty of life itself, it's vulnerable and full of reward.